On Monday, President Robert Mugabe fired his vice-president Emmerson Mnangagwa, sending shockwaves through Zimbabwe’s political establishment. ‘I think that this is one of the most significant political events since independence,’ said David Coltart, a prominent opposition leader and former education minister. Of course, over nearly four decades in power, Mugabe has seen off more than his fair share of potential rivals. But Mnangagwa was supposed to be different. For a start, Mugabe and Mnangagwa shared a long personal history of working together, dating all the way back to 1977, during the liberation struggle, when Mnangagwa was drafted in by Mugabe as his assistant in Mozambique. But far more significant than that were Mnangagwa’s alleged links to Zimbabwe’s influential security establishment, including the military, the police and the ruling party’s military veterans association. According to conventional wisdom, this made Mnangagwa simply too powerful to be fired. Once again, however, Mugabe proved himself immune to conventional wisdom. ‘Mnangagwa more than anyone else has been Mugabe’s right-hand man. 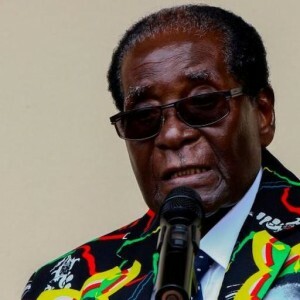 He has been Mugabe’s go-to person on a range of issues, from Gukurahundi to the response to the 2008 election to the organisation of the 2013 election. At the very least, Mugabe has broken with the person who has got all that intelligence about how they have done things. And that situation is compounded by the fact that Mnangagwa clearly has the support of a significant segment of war veterans who have done most of the campaigning for Mugabe in the past ... I see this as a desperate move by Mugabe with high potential political cost,’ said Coltart. In the short term, Mnangagwa’s fall looks likely to pave the way for even greater political prominence for the president’s wife, Grace Mugabe, who leads the Generation 40 (G40) faction within the ruling Zimbabwe African National Union – Patriotic Front (Zanu-PF). The G40, which includes heavyweights such as Education Minister Jonathan Moyo and State Security Minister Sydney Sekeramayi, has now all but vanquished the rival Lacoste faction headed by Mnangagwa. This does not mean, however, that the long-running and increasingly bitter race to succeed Mugabe is over. Far from it. ‘I think that the Zimbabwean succession race has been unpredictable. It’s easy for us to look with the benefit of hindsight and say it all falls into place, but the reality is when [former vice-president] Joice Mujuru was at the top, we all thought she was destined for the presidency. When Emmerson Mnangagwa took over many of us thought he was the one. Now we have Grace, I don’t think we should fall into the same trap as thinking it is all locked up,’ said Alex Magaisa, a political analyst. ‘I do think she is in a stronger position than she was before ... but there’s no reason to believe that G40 is a homogenous entity. There will be people within G40 who have their own big ambitions and have found Grace useful to this point.’ In other words, Grace may not be useful for much longer for any other pretenders to the throne. Ibbo Mandaza, director of the Harare-based Southern African Political Economy Series Trust think tank, is not even sure that Grace really wants the top job. ‘I don’t think it will be Grace. I think the media are misreading. If Grace wanted to be president, she would not have said to Mugabe at the Chinhoyi rally [in late July], and I quote: “Tell us which horse to back” – i.e., choose the successor to be, and we will run with it. She wasn’t saying put me there. She was saying identify a successor and we, including myself as first lady, will back that person to the hilt,’ said Mandaza. Although Mandaza can’t be certain who else among the Zanu-PF leadership may end up succeeding Mugabe, he is clear on one thing: the presidency is likely to remain in the party following the presidential election scheduled for next year. ‘I think given what I’ve described [previously] as an obliging and complicit opposition in the form of the [Movement for Democratic Change – Tsvangirai] MDC-T in particular and all the others represented in Parliament, Zanu-PF is hardly threatened. Clearly they appear more prepared for elections than the opposition. Zanu-PF appear to be in control, if not total control, of the electoral process, so much so that for me elections are a mere formality,’ he said. As the dust settles following Mnangagwa’s enforced departure, attention turns now to the extraordinary Zanu-PF party conference scheduled for 12-17 December. The appointments made here, including a new vice-president, should provide a clearer picture of Zanu-PF’s internal dynamics – and therefore a window into the future of Zimbabwe as a whole.